This FREE utility allows you to monitor your simultaneous calls in real-time, and graph utilization over time. You can set a warning threshold and be notified by email when 3CX is approaching your maximum permitted simultaneous calls. I'm happy to give you this product for FREE! Enjoy! Need help installing? We can help! 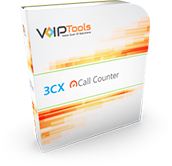 3CX Call Counter is now FREE! Are you worried about running out of simultaneous calls, but you don’t have a easy way to monitor your usage over time? 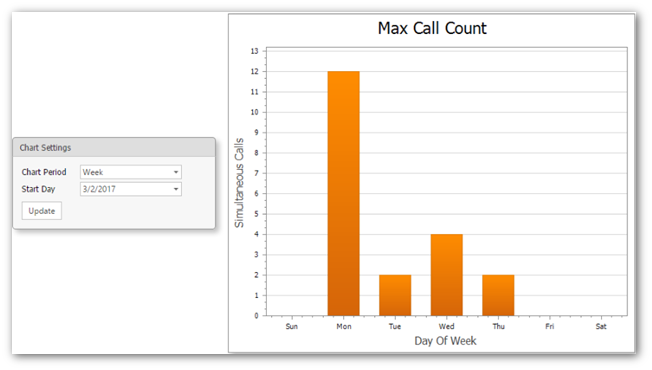 With 3CX Call Counter you can monitor your call volume in real-time, and graph utilization over time. You don’t have to guess what your peak usage is, now you can see call levels at any time. This utility makes it easy to see utilization patterns to estimate when an upgrade of 3CX will be need, and graph usage to easily see seasonal, annual, monthly, weekly and daily utilization trends. It’s a great tool to help you ensure you have adequate staffing during peak periods. Simple: We know once you see how EASY and HELPFUL VoIPTools products are, you will come back for more! Do I have to purchase anything to get this free product? Absolutely not. You just need to register on the site, select your 3CX version and size (simultaneous calls) from the drop down menus on the product page, and add to cart. You will not have to enter any credit card information to get the free products! How do I install Call Counter? Very easily! We will give you a download link and license key which you can use to install and enable your Call Counter. This is very simple to do! If you have any issues, please contact our support line at 801-642-4655 (support queue). We are more than happy to assist you! Can I install this on my 3CX server?